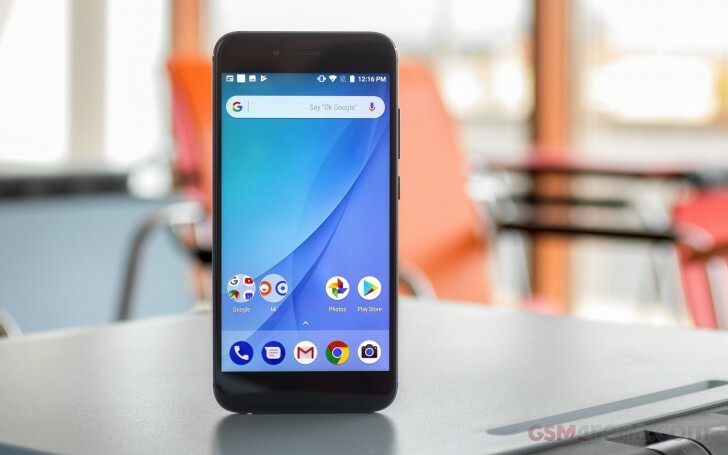 Xiaomi Mi A1 runs on vanilla Android Nougat OS, version 7.1.2. Google has promised at least two major updates for the Mi A1 and Oreo should be coming in a couple of weeks. Everything but the camera and IR blaster is handled by the stock Google app suite and while this approach may not be appealing to some, it does come with two indisputable pros - fast updates and the smooth performance. The feature-rich MIUI might be missed by some, but for others it was actually a disadvantage and they'll certainly appreciate this pure Android version. The lockscreen displays the standard Nougat notification cards, complete with grouping, expanded view and direct reply. There's a camera shortcut, but the camera can be launched with a double press of the power button from anywhere, if you enable it from the settings menu. The Ambient display is present on the Mi A1. It comes to life whenever you get a new notification or when you pick up your phone, provided that you have enabled one or both of those functions in Settings first. It shows the clock and events that might require your attention. The Pixel-like app drawer that you pull up from the dock is your only option. Of course, since there is folder support on the homescreen as well. You can organize everything there and simply forget that the Pixel-like swipe up gesture to open the drawer even exists. A long press on an empty space on the home screen turns edit mode on. This is also where you get access to widgets and wallpapers. The latter can be sourced from the Google Wallpapers app (available in the Play Store), which has the handy option for daily wallpapers. The homescreen setting menu only has a couple of options, but both are interesting. The Google App toggle is used to enable or disable the Google Now interface, accessible through a swipe to the right form the homescreen. There's Google Assistant too - the customary long press on the Home button summons it. A single pull on Mi A1's notification shade gets you six small toggles. Pull a second time and you get a total of 9 large ones per pane, with multiple panes supported. There's also a brightness slider, but Auto brightness is only accessible through the settings menu. The task switcher is business as usual - the Android rolodex is present here. The 'clear all' button only appears when you scroll all the way to the top - a bit of a nuisance. There is multi-window multitasking (thanks, Nougat), but the screen is always split 50/50 - you can't adjust the windows.